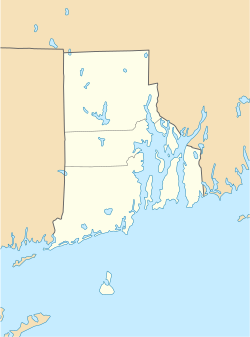 Forestdale is a village and historic district in North Smithfield, Providence County, Rhode Island, United States, one-half mile from Slatersville, Rhode Island. The historic district runs east and west along Main Street and north on Maple Avenue. School Street is the primary road through the village, and the one-room school house for which the street is named still stands. The Branch River runs through the valley adjacent to the School Street. The Village Haven Restaurant and local VFW chapter are also located in the village. The village was originally owned by the Forestdale Manufacturing Company, a textile mill, later purchased by John Slater & Co. The Mansfield & Lamb scythe-shop manufactured scythes and later tools in Forestdale starting in 1824, and during the American Civil War manufactured swords and sabres for Union Forces. The mills used water power from the Branch River to power their equipment. ^ a b *Walter Nebiker, The History of North Smithfield (Somersworth, NH: New England History Press, 1976). Walter Nebiker, The History of North Smithfield (Somersworth, NH: New England History Press, 1976). This page was last edited on 23 January 2019, at 12:24 (UTC).